Blooms Landcare in Fort Worth, TX provides residential and commercial property owners throughout West Forth Worth with high-quality landscaping services. We assist you in designing your dream landscape, perform all installation, and keep everything looking great with regularly scheduled maintenance. It is no wonder why Fort Worth residents are referring their friends and family to Blooms Landcare for all their landscaping services. Blooms Landcare has modern state-of-the-art equipment, along with highly trained and friendly staff who come together to quickly, efficiently and concisely achieve landscaping perfection. When you give Blooms Landcare a call, we will meet you and evaluate the property, discuss all options and ideas, and provide you with detailed schematics put together by our talented designers. After we get your approval, you can sit back and relax and let us do the rest. In regards to your business or company’s lawn area, this is also a job that we can tackle. We understand at Blooms Landcare that the exterior of a property provides the first impression. This means that your office building’s reputation can actually rest on the way your landscape looks. As strange as this may sound, it really makes sense when you think about it: first impressions mean everything! Let the Blooms Landcare team be your commercial landscape service. We understand the importance of your company’s lawn, and in the consultation, we ensure that what you want to show is articulated. We will provide the first impression that your business deserves. Not only do we pay attention to the “first impression” that is your landscape, but we do so much more. In fact, we offer complete landscape service. This means that whether it’s your home, your business, or your vacation cabin, we can keep it aesthetically pleasing and in top shape completely. A landscape plan should take into account soil conditions, drainage, area usage, materials desired, sun, shade, slope, level of maintenance desired and other factors. Visual methods can be used such as perspective renderings, virtual 3-D models, and graphic fly through modeling. The landscape professionals at Blooms Landcare specialize in vibrant garden design to enhance any residential yard or commercial property. A large part of maintaining a brilliant landscape is keeping it adequately hydrated. Our experts are knowledgeable in installing water sprinkling systems and other water features such as fountains, ponds, and waterfalls for gardens and outdoor living spaces. Accentuate your landscape further with hardscape services including retaining walls, arbors, and gazebos. What can I expect from landscaping service? 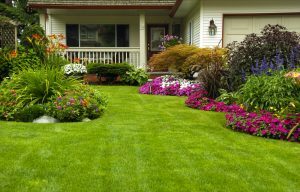 Some homeowners are hesitant to hire professional lawn service. They hear conflicting reports from their friends. The key factor in a good landscaping experience is the company that does the work. You need to carefully choose the right landscaping service. Your choice will leave you either a beautiful lawn or a mess you’ll need to clean up. When researching a landscaping service, look for reliability, experience, and the services you need most. Landscaping services include irrigation, landscaping, fertilization, and more. Find a company that fits your needs. Before you hire a professional landscaping service like Blooms Landcare, you’ll want to speak with someone in person. This allows you to ask questions, request specific service, and learn about what contracts they offer. You might have specific instructions for certain sections of your yard. Find a service provider who will listen to you and respect your wishes. To speak to our landscaping experts in Fort Worth, TX, call (817) 688-5352 or contact us online. Financing is available on new landscaping service. Be sure to mention it when you call. We would be happy to provide you with top quality landscaping services.